King Don Felipe VI and Queen Dona Letizia of Spain arrived on Wednesday afternoon in Rabat for an official visit to Morocco, at the invitation of King Mohammed VI. 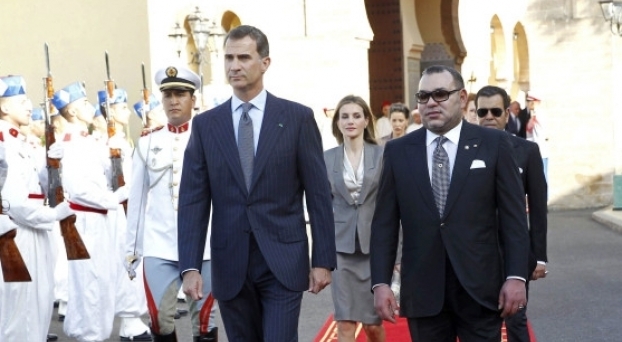 The visit, King Felipe’s second to Morocco since he assumed power, celebrates the enduring partnership and dense relations existing between the two countries. Upon arrival at Rabat-Salé airport, the Spanish Sovereigns were welcomed by King Mohammed VI, who was accompanied by Crown Prince Moulay El Hassan, Prince Moulay Rachid and Princesses Lalla Khadija, Lalla Meryem, Lalla Asmae, Lalla Hasnaa and Lalla Oum Keltoum. The royal procession then headed to the Royal Palace in Rabat where an official welcome ceremony was held in honor of the Spanish guests. During this visit, King Mohammed VI and King Felipe VI will hold talks and will chair the signing of several conventions between the two countries. In the evening, King Mohammed VI will host a dinner banquet in honor of his guests and their accompanying delegation, which includes several cabinet members. The official visit will also be marked by the holding of a business forum. The visit reflects the depth and quality of bilateral relations, and the shared desire to consolidate the multidimensional strategic partnership between the two neighboring and friendly countries, had stated the official statement announcing the Spanish king’s visit. Written by: Jaber Ali on February 13, 2019. Posted by Jaber Ali on Feb 13 2019. Filed under Headlines, World News. You can follow any responses to this entry through the RSS 2.0. Both comments and pings are currently closed.